Welcome back to the H. Moradi blog! Jewelry, and how we adorn ourselves has power. A diamond necklace might not have actual superpowers, but it can possess a type of power. It can transform an outfit, it’s beauty can silence a room, or empower the wearer to walk more confidently. 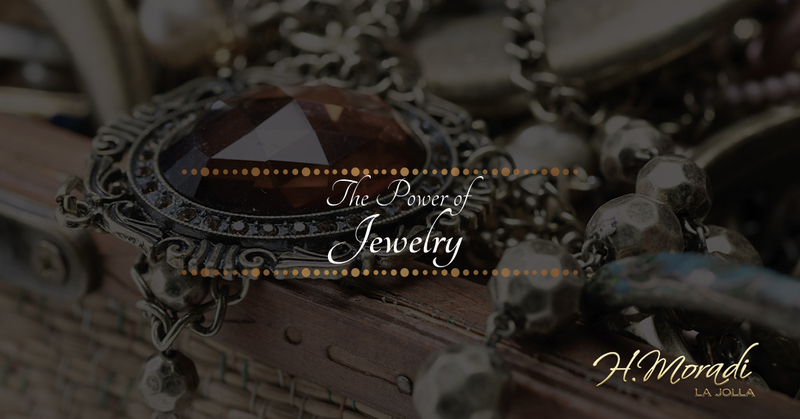 Today, on the H. Moradi Jewelers blog we are going to take a break from our jewelry buyers providing tips for buying and selling jewelry to share a little history and take a look at literature to see how jewelry both imaginary and real have possessed power. Mankind has always loved to adorn themselves, whether it was a necklace made from leather and bone beads or a diamond necklace created from some of the rarest gems. Throughout history, jewelry have been used to harness power and to protect against evil spirits, illness, and bad luck. South African tribes mutilate themselves with permanent jewelry that distort their mouths to instill fear in their enemies and so opposing tribes won’t steal their women. The characters of Frodo and the Fellowship of the Ring must destroy the ring before the Dark Lord Sauron and get his ring back: obtaining his ring would mean regaining his power, ruling Middle Earth, and letting evil have full reign. Throughout history, rulers of dominating tribes or countries have worn specific types of jewelry or other elements to show that they have the power: in primitive tribes it may have been something as simple as an ancient carved stick. As society progressed, crowns and other types of elaborate types of jewelry became the symbols of power. Rulers have donned crowns, scepters, orbs, swords, ceremonial maces, rings, and other bejeweled wonders. Today, even though those piece of jewelry aren’t worn on a daily basis, they are are still held in high regard and kept in places of high security such as the Tower of London. Does Your Jewelry Lack Finesse? There are many other examples of powerful pieces of jewelry that can be found in our world, our history, and literature. Though we don’t believe that any of the jewelry that we at H. Moradi Jewelers handle at either of our jewelry store locations in La Jolla have super powers or can bind the world in darkness, we do believe in the power that one piece of jewelry can have: it can transform an outfit or give you the confident power for your next big event. If your jewelry is feeling less than inspired and you need something new, come visit us! Talk to our jewelry buyers and trade in your jewelry for something new! Learn more on our website and visit us in La Jolla.